We love simple jewelry loaded with meaning and that is exactly what this beautiful necklace is all about. The sterling silver moon charm has "I Love you to the Moon and Back" stamped on the back and then can hold 2-4 birthstones representing each child or the entire family. Sterling silver necklace is available with 2, 3 or 4 stones. The simple moon birthstone necklace says so much with a simple statement. 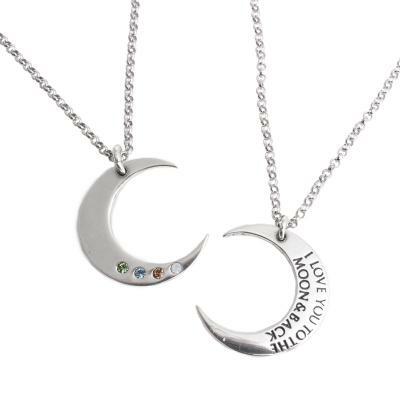 Show who you love to the moon and back with each birthstone crystal representing a love in your life. How many to you love to the Moon & Back? On this simple necklace you can count up to four kids or all the members of your family! Each birthstone can represent someone you love. You can put just the birthstones of your kids or grandkids or you can include mom and dad too. If you only have one child, select the 3 stone necklace and add the parents birthstones as well. If you have 2 kids, do the same thing and create a family necklace you will love! The above price is for 2 stones. If you want more stones the price will increase. The necklace is available in 16" and 18". Made of sterling silver and the birthstones are Swarovski crystals. All sales are final. This necklace is so sweet. It was a perfect gift from my boys. Sometimes we challenge sayings even further from the moon, so they loved the necklace too. Very beautiful!! This necklace is very precious to me. Nice quality. Perfect size.